Hi loves! How are you doing? I am currently not in the country, but working really hard together with my colleagues on a volunteer project in Mikoszow, Poland. We are helping to finish a home that will be used as a guesthouse/hostel for other volunteers that come help the foundation expand and make sure they can give care and attention to all of their clients. Hopefully my nails will survive and if they don't, well there are other things to worry about in life right? Today I have a fun and simple look to show you. The other day I felt like doing glitter tips and what other polish could be a better base than my beloved OPI Don't Bossa Nova Me Around? So I used 2 coats as my base and let it dry. Then, I grabbed a small piece of sponge and dropped some beads of Shimmer Sonia on the back of a stamping plate, and used the sponge to create a gradient on my tips. I've been using Glisten & Glow HK Girl Topcoat and I really like it. Combined with the Stuck On Blu! base it seems to make my polish last longer and the shine is impressive. It also dries fast. However it isn't super thick so these glitter tips might have needed a second coat to feel completely smooth. Do you still enjoy glitter gradients? And what color combination is your favorite? Tell me in the comments! This is super cute! I love that Shimmer glitter! They really are! So versatile :-). 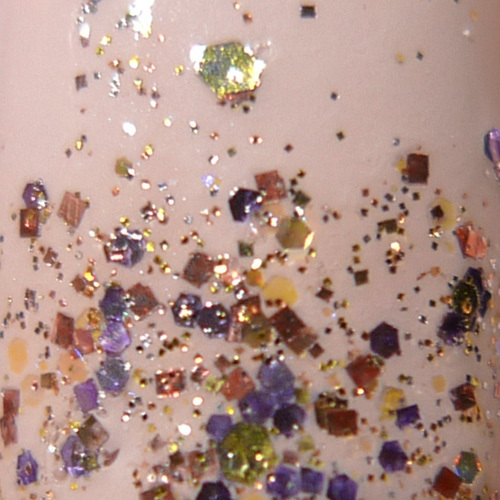 Ooh, this is a beautiful glitter! Of course Shimmer always does fabulous mixes, but I especially love the combination of orange and lavender over this pretty, pretty base!